Knit anything and everything you want, and enjoy the scenery! We love our new "home" at 1309 Broadway in the newly- renovated building that faces Broadway. We are open for business 5 days a week, and can be accessed by parking behind the building "Off Broadway" and entering through the rear door which is our front door. (Concrete sheep "flank" either side of the entrance.) We are very excited about our new space where everything is on one floor with plenty of space and light! You can't miss your turn when you are coming from the South on Broadway! IN WINTER WEATHER, we suggest you enter using the Lavina Street entrance which is the street directly to the south of our building next to the Spay-Neuter Clinic. Lavina is a wider street and more accessible. 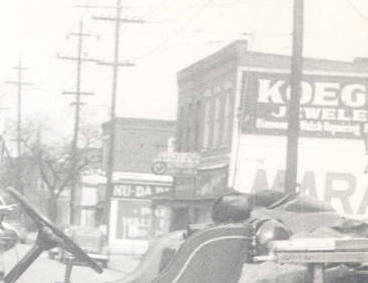 This was taken in the 1920's (we think). Our venture started on December 28th, 2007 in the yellow building on Brackenridge, just feet from our current location. Jan Bell and her daughter Natalie Bell have opened a yarn store filled with warmth, color and a great selection of natural, and luxury yarns. Natalie is always looking for the next "must have" product and continues to make Knitting Off Broadway's yarn and accessory selection a combination of her three favorite yarn shops (The former Cass Street Yarn Depot, Northampton Wools, and Cynthia's Yarn and Gifts). There is, and will continue to be, a wide variety of yarns and accessories available! Click here to see our ever expanding product listing. 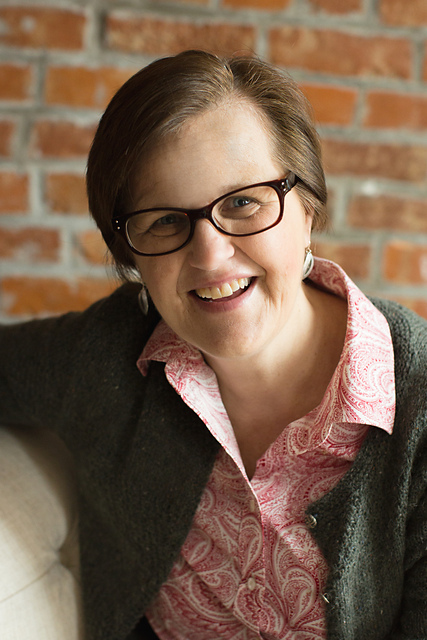 Jan Bell was convinced by Natalie and other members of the knitting community that a yarn shop needed to be her next project, so she agreed since she had yet to work retail in her life. (It would also bring Natalie, her only child, back home to Indiana to manage the store!) 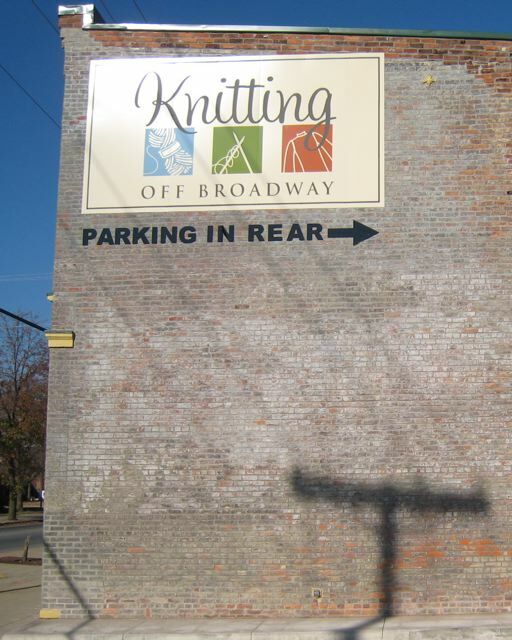 Then, a few months later, she bought the brick building across the parking lot to restore which, after 15 months of restorative work, is now the home of Knitting Off Broadway.... opening for business at 1309 Broadway November 4, 2009! Jan now knits store samples determined by her headstrong, marketing-minded daughter! Here she is wearing a Churchmouse Modern Wrapper using a tweed yarn held with a lace weight mohair. 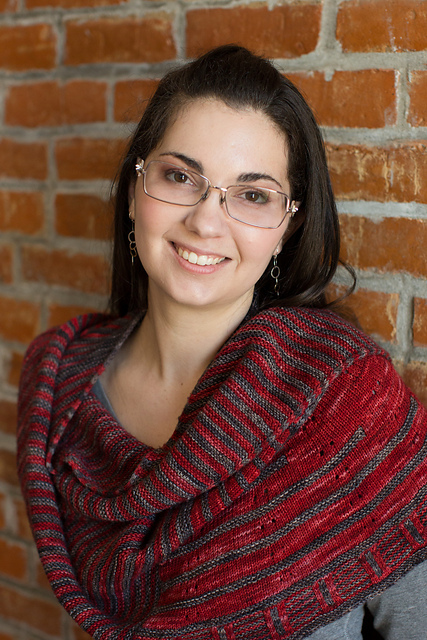 Natalie Bell-Kearney is a Smith College graduate who worked at a yarn shop all throughout college. Having learned the business and having always worked retail, a yarn shop was a logical choice for her. Natalie likes to knit for the store, friends, family, and herself! She is always trying to knit up the latest samples for the shop, and is constantly finding new yarns and other goodies for the store. Here she is wearing the ever popular Rockefeller pattern by Stephen West. She used Koigu yarn (3 skeins in each color) and had a great time knitting this on her honeymoon. Donna Veiga is a talented knitter who has taught many classes at Cass Street Depot. Donna is enthusiastic about working, and joins us on days when she and her husband aren't traveling. Donna also loves to rip out sweaters... Mountain Colors "Mountain Goat" knits up beautifully the second time around! Tami Easter is a longtime knitter who wandered into our shop not long after we had just opened. Tami thinks of knitting as a lifestyle - not a hobby! She began knitting because it was a lost art to "my generation", and loves to knit with her twin daughters, Hannah & Emma. Tami is also an excellent seamstress, full of energy and fresh ideas. Hannah & Emma enjoy making store samples as well as knitting their own items. Tami is wearing a sweater by Kim Hargreaves knit out of her favorite yarn, Rowan Felted Tweed. Ruth Guerin joined the staff in 2010 after being a customer since we had opened. 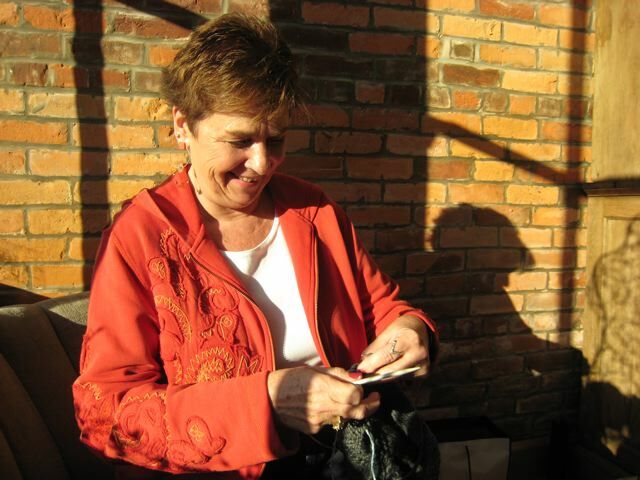 Ruth enjoys knitting animals of all varieties, and loves knitting with yarns by the Fibre Company and Alchemy. 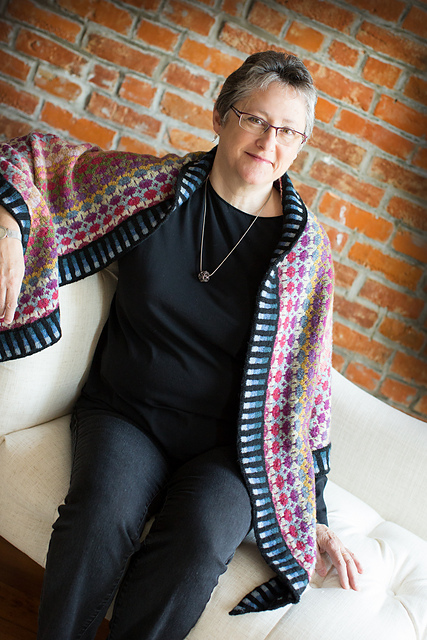 Ruth is wearing her Chrystal Seyfarth shawl kit that her husband thinks should be framed on the wall! This shawl was knit in the round from many different colors that you changed whenever you wanted, and then at the end you cut the opening and then knit on the border. Anyone who knows me knows that I have many knits going at one time, in various stages of progress. Some are comprised of wound balls in a bag with the pattern. Some are half-done sweaters or scarves. Some are completed except for the seaming. And some are seamed and just need to be blocked. I rotate these projects, sometimes going on finishing kicks where I pull out the "almost-dones" and finish them, one after another. I really love those, instant gratification! I also love starting projects, and I let myself start new ones while old ones are still in progress. I find that new projects keeps my enthusiasm for knitting at top speed. To me, looking at yarn and patterns and starting new projects is the lifeblood of knitting,there's always something new to work on! 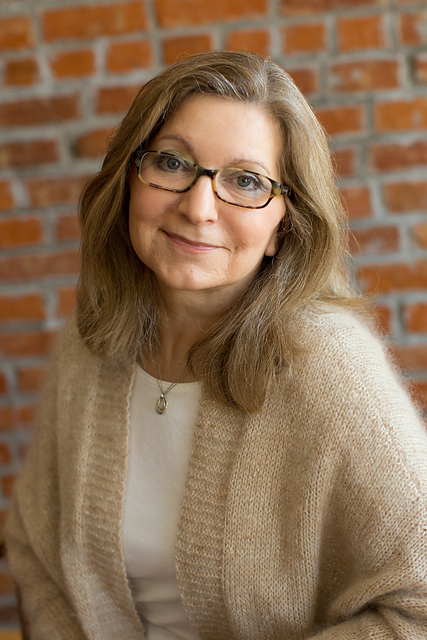 One of my knitting idols, Vicki Square, decided to become a starter, too. Here she is to inspire you to do the same! "Start as many new projects as you can!" That's my new motto, and I'm sticking to it. I'm not talking about mindlessly and indiscriminately knitting any old thing with any old yarn you can get your hands on; instead, I'm talking about choosing new projects wisely and for very specific beneficial reasons. Yet recognizing that creativity is fluid, I want to keep a steady stream of new experiences flowing with as many different kinds of projects as I can manage. My old motto was "Finish as many projects as you can." Although finishing projects was a functional goal, it wasn't any fun. Don't get me wrong: I like to finish things and wear them, use them, and give them as much as the next person. But as a primary goal, the focus on finishing brought forward momentum to a halt. I ignored the insistent need to create new and fresh ideas; I trampled all over my enthusiasm and enjoyment. Well, I finished . . . and I learned a valuable lesson. Then I traded up on my motto. What design? What yarn? What colors? These Big Three questions form the central force of knitting inspiration. Contemplating all the possibilities is the core thrill of a new knitting project: a design idea prompts a quest for the perfect yarn to bring the vision to life. Join me in the freedom my new motto offers and realistically evaluate your knitting and yarn stash. You may have yarn to give away, to friends who need a boost, to kids learning how to knit, or to a local charity knitting group. Some projects in progress you will definitely complete, simply because you are still connected to the initial inspiration. Some projects started with fabulous yarn, but the design no longer holds interest; it's time to ravel and reuse. And frankly, some projects deserve a decent burial, perhaps on the far side of the moon. You won't finish the knitting, and you know it. What can be done? First, with a mental flick of the wrist, get rid of the little gargoyle who sits on your shoulder chastising you in whispers for not finishing your knitting. Second, pretend that all your half-done knitting belongs to someone else and you have been given carte blanche to update or redirect the original vision. A large pullover or cardigan can be cut down and made into a pillow. A half-finished Fair Isle sweater can be lightly felted and sewn into a hat. Whatever you do, refuse to make yourself a hostage to the undone. Enjoy the creative flow of having many knitting projects going simultaneously, just as you enjoy a car ride without worrying about each individual moving part. I find I can place my knitting projects on a scale much like a speedometer. On the 10 mph end of the scale are the projects that have no time parameters, so I can relax and take as long as I want to finish them. On the 120 mph end of the scale is power knitting: a specific project with a specific deadline. Laying aside all else, I power through to the finish line and find doing so spectacularly exhilarating. Most knitting projects, of course, lie somewhere between a crawl and a drag race.